ROME (CNS) — Before celebrating Mass in a parish in Ostia, Rome’s seaside community, Pope Francis stopped to see two Little Sisters of Jesus who live in a trailer at an amusement park, sharing their lives and faith with the carnival workers. The Vatican provided no more details of the visit to “Luna Park di Ostia,” but the fact that the carnival grounds are near the parish came up during his conversation with the children and youths of Ostia’s Mary, Queen of Peace parish. 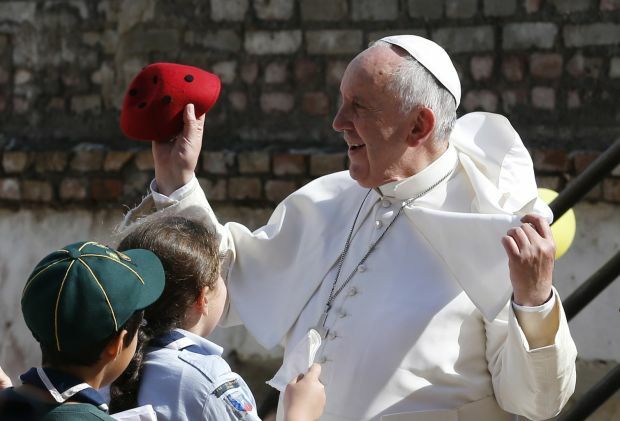 Asked where joy comes from, Pope Francis told the young people, “It can’t be bought at the market” and “you don’t get it because you won a game at Luna Park. No. Joy is a gift” and is something people should pray for. “If I am sad, if I’m down, if I’m lazy and don’t know what to do, I must ask the Holy Spirit and he will give me joy because it is a gift of the Spirit,” the pope said. Having the gift of joy, he said, does not mean one will never have problems and never be tempted to do something wrong. Meeting with dozens of parents whose children have been baptized in the past year, Pope Francis pleaded with them not to say “arrivederci” until it is time for the children’s first Communion. Remaining part of the vine, he said, requires “friendship with the Lord” through prayer, reading the Bible and receiving the sacraments, especially the Eucharist and reconciliation.